The What: Peavey Electronics has launched the Dante-enabled Versarray Pro, a fully articulating line array system with ribbon drivers. The What Else: The Versarray Pro system allows the user to select analog, Dante, or Dante with analog backup, ensuring reliable, uninterrupted performance. 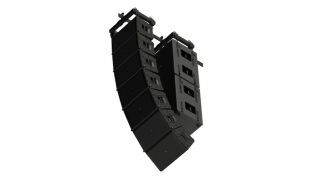 As a fully articulating line array, it is capable of providing maximum coverage and audio quality in a wide variety of applications. It also features Peavey’s FlyQWIK hardware, enabling quicker deployment. The powered cabinets include network control for the advanced user as well as quick push-button control for setups where time is of the essence. Network controls include FIR filters, 10-band parametric EQ, noise gate, limiter, auto off, and all back-panel functions. The Versarray Pro also incorporates Peavey’s Mark III ribbon drivers and proprietary CLEAR FORM Waveguide to deliver optimum high-end clarity. The Bottom Line: Versarray Pro is engineered for pro audio applications where high output, optimized coverage, and high-fidelity audio are required—especially live entertainment, houses of worship, and other expansive venues.